In the past, I’ve been using a HP photo inkjet printer. The quality is superb, but ink cartridges cost RM100+ per month for my volume of printing (hundreds of flash cards each month). After a friend suggested the “ink tank system”, I explored further and found out that Epson released the first range of printers with in-built ink-tank systems. This is also known as Continuous Ink Supply System (CISS). This means there’re huge external ink tanks at the side of the printer, for high volume printing. There’re several models of Epson L-series CISS printers. I needed to print flash cards with photographs, so opted for the L800 with full range of colour ink tanks. I bought my Epson L800 at Low Yat (Malaysia) at about RM800+. The ink tanks have lasted me 1 year of printing (some heavy-duty months, some lazy months). I’ve just bought ink tanks at RM36 each. Previously, I’ve made flash cards using 300-310gsm art card. (Thick cards are easier to flash fast.) However, I couldn’t find any ink-efficient printer that could print on such thick paper. The print, glue and stick method is rather time-consuming for large number of cards. The print and stick method shared here is much faster, but incurs the cost of adhesive paper. The most efficient is printing directly. With Epson L800, I’m now printing directly on 270gsm paper, which saves me lots of time. I’ve been flashing 270gsm cards, which is still fast enough. Tip #1: Get paper without glossy finishing, i.e. as paper-like as possible. This absorbs ink faster instead of running at the edges. (Deleted on 17/11/17) New tip: When printing on glossy art card, go to Print, Print Settings, under Media Type, choose Epson Premium Glossy. Fabulous print quality! Tip #2: Remember to print something full-colour every week or so. If you’ve nothing to print, just run the simple test print. This ensures that the printer ejects some ink, so that the nozzles won’t be clogged. If they become clogged, there’ll be white lines across the image. You’d then have to run the cleaning function a few times till the problem is resolved. For bulk savings: Find a local paper supplier near you. May request for some or most to be cut into A5. 10, Persiaran Cahaya 2, Taman Cahaya Indah Light Industrial, 68000 Ampang, Selangor Darul Ehsan, Malaysia. No. 12 Jalan Brunei Barat, Off Jalan Pudu, Kuala Lumpur 55100, Malaysia. Just curious, how many of the blank flash card could you load at one time? Is there a limitation on the feed? I didn’t try the limit…. At least 20 pieces of cards. My current batch of card stock doesn’t absorb the ink well like paper, so I’d print in batches of 10. As the ink dried, then I’d print more. So, if you get blank cards that absorb well like paper, you’d be able to mass-print much better. I can mass-print well on paper. Does this mean that you have stop sticking a4 papers on the stock cards and is printing all your cards directly now? Is this faster than your adhesive paper method? Hi Vivian, as I’ve stopped sticking and printing directly. Exception: for pictures that need high resolution to show small details, I may still print on adhesive paper & stick. Hi mievee, thanks for all your wonder tips. Is really useful for new mummy like me. As I am a working mom, i could only spend the most half an hour a day to do flashcard with my daughter. 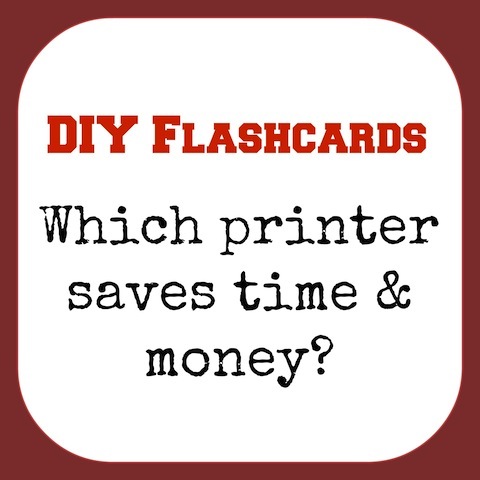 Hence I just had a debate with my hubby, I am pro the physical card flashing method but hubby thinks the e-flash card (ie from Brillkids) has th same effect. Appreciate your thoughts on this: Will e-flash card has the same effect as physical flashcards. TIA. 1. Right brain education is a lot more than flashcards. That is, flashcards is only 1 component. Right brain activities can be very short. Dedicating 30 minutes a day to do home practice is a great start and routine. If it takes more time, it’s probably because the child wants to repeat the activities more times, or do a lot more. If you decide to focus on flashcards, then it actually takes a very short time. Choose 1-2 cards to explore / explain / discuss in more detail. Perhaps a few more minutes. – before flash cards: relaxation, breathing and perhaps imaging. Child would be able to focus better. – after flash cards: reading and speed reading. Helps in reading, language, and building memory. Easy to transit to bedtime after reading time too. To me, the primary purpose of flash cards is to activate the right brain and not to stuff knowledge into the children. The right brain learns best when it’s based on a strong relationship with parents. Therefore, it needs real-life interaction with parents, in a personal and fun way. This cannot be replaced with screens. To learn to speak well, a young child needs to see the parent’s lips when the card is flashed. This also cannot be replaced with screens. – very interactive and can hold the child’s interest for up to 1000 cards, if she wants to. Mummy can vary the tone, have exaggerated facial expressions when needed (dramatise at certain cards). If child is fidgety, pause to sing a song with hand actions, then continue flashing again. Etc. – no distraction with an electronic device. Using an electronic device tempts my children to request to view photos, videos, and play games. And tempts them to press buttons. Out of sight, out of mind. So I prefer to use hard copy books and materials, especially with kids below 5-6 who have yet to develop sufficient self-control over screens. That’s why I don’t choose e-flashcards. If a family has no space / budget / time at all for physical flashcards and has a slightly older child (perhaps 2 and older), then e-flashcards may be an alternative. This is similar to choosing physical story books over ebooks for young children. If there’s really no choice, then at least ebooks is better than not reading at all. Just that it isn’t my first choice. Feel free to join my next workshop when it’s launched. KL: 24/5 & Singapore: should be 6/6. Join mailing list at the side bar to be kept updated. Hope the above helps you and all the best. If I want to print out directly ,is it work on 270gsm wth Epson L355? a4 easier or A5? Hi Vivian, I’m not familiar with Epson L355. Please check its online manual and printer specifications. Or enquire with a shop, bring your thick paper to request a test print. If the printer can accept your paper, either A4 or A5 would be fine. Just choose when you’re printing the image. Set the paper size to the correct one. Have your ever tried 250gsm paper? is that thick enough to flash smoothly? i called up the SNT Marketing, however, they dont have 270gsm stock. and the 250gsm A5 matte art card is selling at RM0.12/pcs now. The thinnest I tried is 270gsm, which I find ok.
I’ve seen video of mummy using 250gsm. There should be many paper wholesalers in Malaysia. Try asking someone working in an office, to get the paper supplier contact. Before buying, try getting 2 pieces of sample to print and flash. Just to check on this model printer, how do you place the cardstock? Isnt the tray of the DVD printing or just put in the normal paper feed tray? I had a mummy who mentioned she cant print on 270gsm paper and so it is confising as I am planning to invest on this printer. Appreciate your sharing and input on right brain training. May I know do you have any workshop coming up? Thanks! Hi Jazz, you may check out my e-workshop here.